When choosing a life insurance policy two of the main types of plans available are term life insurance and whole life insurance. There are major differences between the two types of policies and this article will assist you with making the choice between term life insurance vs. whole life insurance. Whole life insurance (or permanent life insurance) is a policy set up where a set benefit is to be paid out on the death of the insured and does not expire (as long as all required payments are made). The cost to the insured individual is often monthly or annual payments established at the onset of the policy that will not be changed over its life. The value of the policy is often a lump sum payment that is paid out on death or when the insured individual reaches the age of 100. One benefit of whole life insurance is that it can be a good 'forced' saving measure for individuals when planning for their spouse or dependents. The cost of these policies can be high so they do tend to be utilized more by individuals with high income already. The biggest benefit of the plan is that the cost, while high, does not increase over time like term life insurance does. Once the terms are established the cost will remain the same. 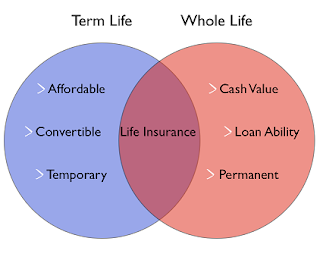 When it comes to purchasing term life insurance vs. whole life insurance the decision typically comes down to cost. While whole life insurance is a guarantee and the cost over your life will be consistent, it is initially often too pricey for many individuals starting a family or whom are recently married. In these cases term life insurance is likely the best route to go to ensure that you guarantee the financial security of your loved ones. As with any major financial arrangement it is important that you do review all of the details so that you have a clear understanding of the terms of your policy and don't have any unexpected surprises.